Notes: Griggs; Betz # 168 first state 168.1 A; The Danckerts family's first map of Africa by Dancker Danckerts is dated 1661. The secornd one was by Justus Danckerts in 1683. 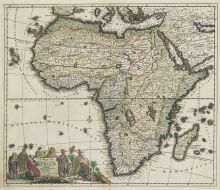 This is the third folio size map of Africa prepared and issued by the Danckerts family.